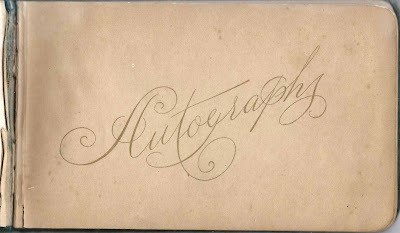 The last page in this 1890s autograph album is inscribed by Mrs. G. B. Haley on 25 December 1891 to Mary Louise Elliott of East Barrington, New Hampshire, so I'm assuming this was a Christmas present to Mary. The album contains several signatures of people who signed at "Sunny Bank", which was the Sunny Bank Home for women and children at Watertown, Massachusetts. The Sunny Bank Home was founded in 1887 for needy women and children undergoing medical and surgical treatment and recuperation, mainly through the efforts of Gouldsboro, Maine native Dr. Almena Jane "Minnie" (Guptill) Baker Flint. Read an article published in the Boston Evening Transcript issue of 19 February 1895 about the founding and purpose of the Sunny Bank Home here and an earlier article in the Boston Evening Transcript, issue of 6 July 1888. 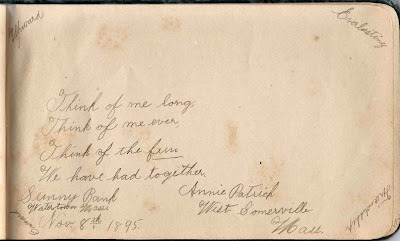 Annie Patrick of West Somerville, Massachusetts, inscribed a page on 8 November 1895 at Sunny Bank in Watertown, Massachusetts. I don't know if the signers who mentioned Sunny Bank were patients at the Home or if they were there for fund raising events, or both. 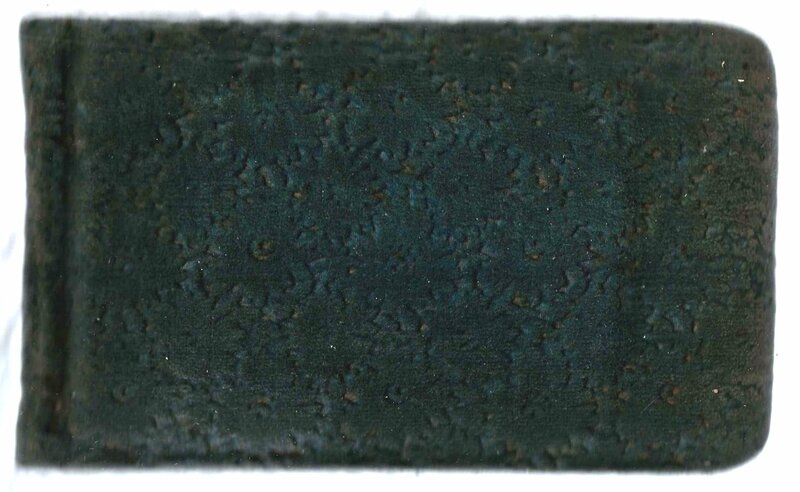 The album is approximately 7" x 4-1/2" and contains pages signed by 33 of Mary's relatives and friends. An alphabetical list of the signers appears at the end of this post. 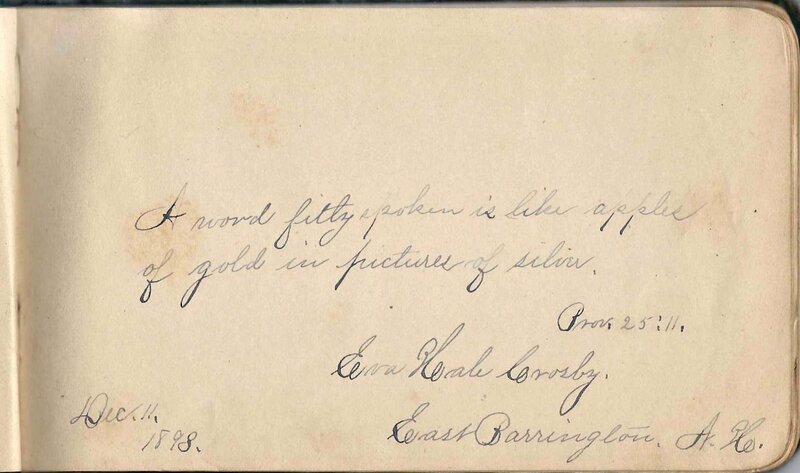 Eva Hale Crosby of East Barrington, New Hampshire, signed a page on 11 December 1898. Captain Nellie A. Price of Pawtucket, Rhode Island, signed at Dorchester, Massachusetts, on 30 November 1895. 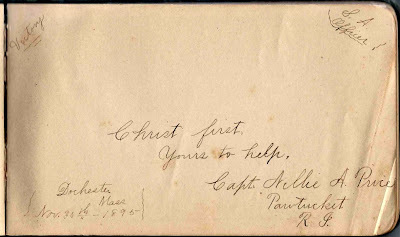 Nellie was an officer in the Salvation Army. 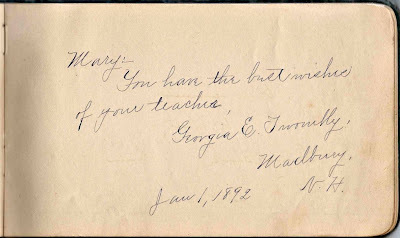 Georgia E. Twombly of Madbury, New Hampshire, signed a page on 1 January 1892. Georgia indicated that she was Mary's teacher. 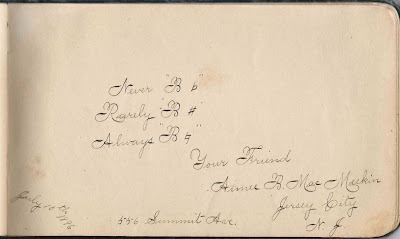 Aimee B. MacMeekin of Jersey City, New Jersey, 556 Summit Avenue, signed a page on 10 July 1896. If you have information on Mary Louise Elliott or any of the signers mentioned below, please leave a comment or contact me directly. Thanks! 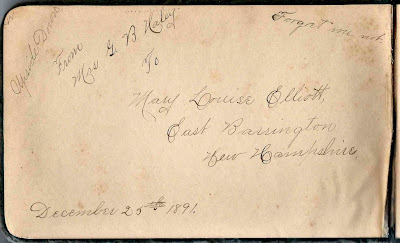 Josephine H. Haley of East Barrington, New Hampshire, signed on 25 December 1891. Mary Josephine (Ham) Haley, wife of George Benton Haley. Written upside down on the last page in the album, inscribed on 25 December 1891 by Mrs. G. B. Haley to Mary Louise Elliott of East Barrington, New Hampshire. 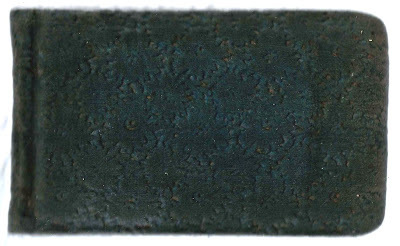 Other than another page inscribed to Mary, this page is the only clue to the album owner. Mrs. G. B. Haley may be Mary Josephine (Ham) Haley, wife of George Benton Haley, both of whom signed pages earlier in the album. Captain Nellie A. Price of Pawtucket, Rhode Island, signed at Dorchester, Massachusetts, on 30 November 1895. She was a captain in the Salvation Army. I couldn't find this young (?) lady. I wonder if she had been taken in, but not adopted, by George and Josephine Haley. In 1900 they had two adopted daughters and a number of other young girls living with them. There were no Elliotts that signed the book, so where is her family? No birth, marrriage, or death records for Mary Louise Elliott at ancestry or familysearch, and nothing at rootsweb or findagrave. Vina H Twombly was Georgia's younger sister. Vina was born in 1878 and Georgia in 1869. This led me to think that, while Georgia was Mary Louise's teacher, Vina was a friend and more likely Mary Louise's age. But that got me nowhere also. 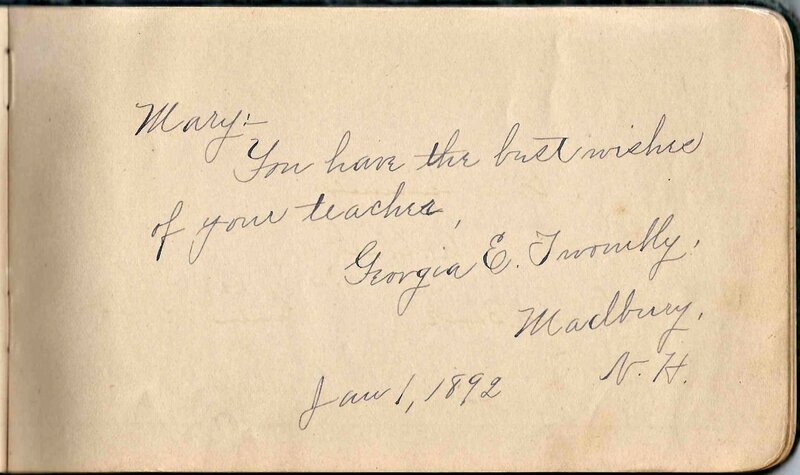 The Sunny Bank signings start in 1895, so maybe Mary Louise was a patient in the fall of that year. Annie Tout, a signer, was a nurse at Sunny Bank in 1897, then matron in 1899. (ancestry's city directories). 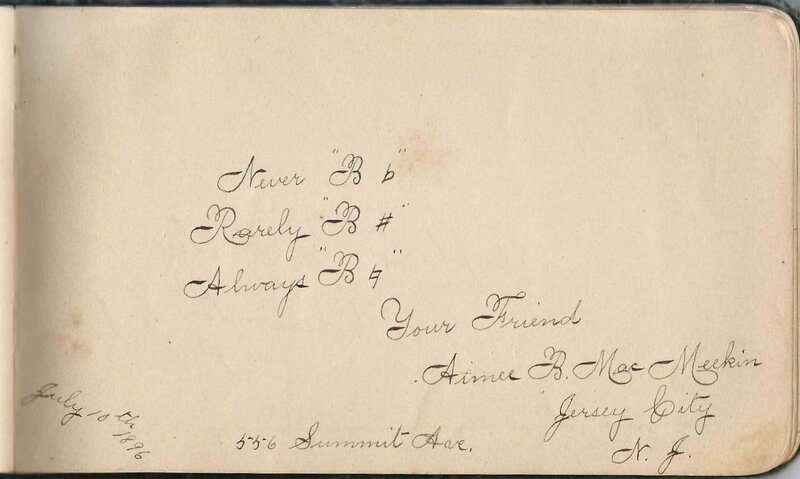 Aimee/Amy B MacMeekin is a sister in law in household of Charles R Hale in Lynn, MA in 1900. But Charles had been born in Barrington NH in 1868, and his mother's maiden name was a Roberts. There were signers with surnames of Hale and Roberts. Aimee signed in 1896, so perhaps Mary Louise was back in NH in that year and until at least the 1898 of Eva Hale Crosby of East Barrington NH. 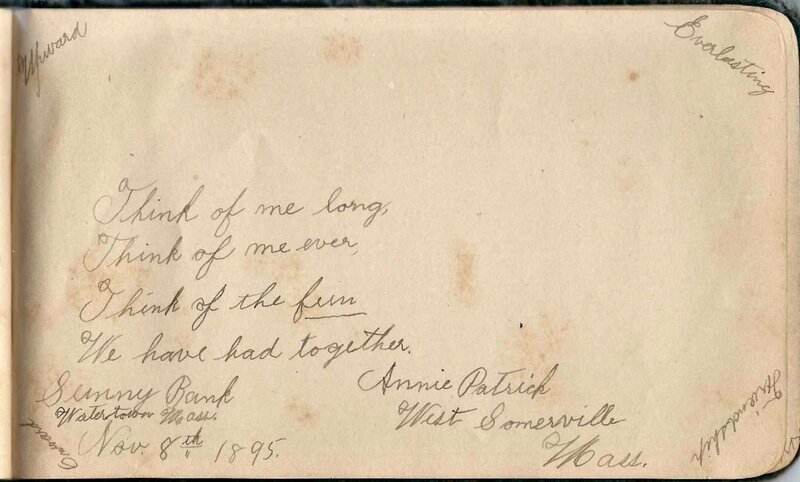 The last signing was in 1905 at Sunny Bank, so perhaps Mary Louise was a patient again. Or she returned there to work, but where are her censuses in Watertown MA, etc., etc. 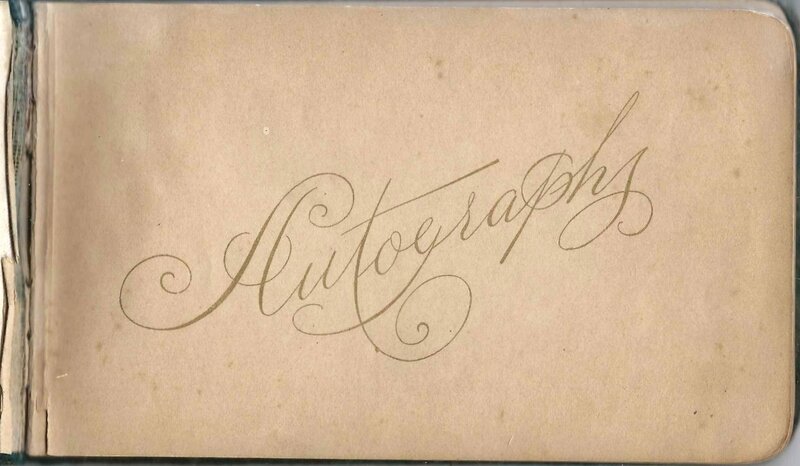 This autograph book seems to be the only trace of her on line. I think I will subscribe to the comments and see if anyone knows anything about her. I think you're on the right track about Mary Louise Elliott, both regarding her relationship with the Haley family and regarding our only hope being that someone with knowledge of the family happens by and leaves a comment. This album had me going in several different directions. When I first got into it, I thought Sunny Bank was a tourist home in New Hampshire, though when I searched the name I kept running into references about an institution in Watertown, Massachusetts. Then, helpfully, one of the signers mentioned both Sunny Bank and Watertown, Massachusetts, whoa! That led me to researching Sunny Bank and finding that the woman doctor who spearheaded its establishment was from Gouldsboro, Maine, which was heartwarming - a woman doctor AND a humanitarian, nice! Ed, thanks for spending your valuable time on this mystery. I've always said that I prefer to feature the heirlooms of people who led hardscrabble lives and might have left no other trace. This may be one of those cases. Mary may have been a Massachusetts native who was a patient at Sunny Bank and, as you said, was taken in by or spent time with the Haley family in New Hampshire.